Today we're having a BONUS interview and giveaway! That's right, this one is NOT included in the basic 12 giveaways. Yay! There may be more... maybe. and this one is REALLY easy to enter. No follower requirements, no extra entries, just enter! Maria is one of my absolute FAVORITE authors of all time ever since I read Poison Study years ago I have LOVED every single book that Maria has written. Check out her AWESOME interview, and then enter to win the prizes she donated. So happy! Squee! Q: If you could have a birthday party with any theme you chose, what would the theme be? A: I’m a sucker for those beautiful frilly ball gowns like they used to wear so I would have a masquerade ball as my theme. Q: In Poison Study we are led to believe that Ixia is a oppressive dictatorship. But as I read on in the series, I actually started to like the way Ixia was ruled. What were you thinking when you created that society? Q: Would you rather live in Ixia or Sitia? Why? A: Ixia – because I wouldn’t have to worry about what I’m going to wear every day. Plus men look so handsome in uniforms that’s an added perk! 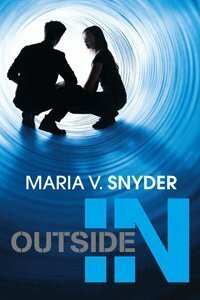 Q: You have published three distinct YA series: The Study books, the Glass books, and now the Inside Out books. Which were the easiest to write? Hardest? Was any one particularly gratifying or challenging? A: They were all difficult – like a pack of unruly children J Of all seven, INSIDE OUT was the easiest in I already knew the beginning, middle and end when I started the book. With the others, I tend to get an idea and character and a vague ending point then just roll with the story. I spend the first half worried I don’t have enough story for a novel and then spend the second half worried I have too much! Both FIRE STUDY and SPY GLASS were more gratifying and challenging since they end the series (for now) and I needed to find a good place to leave my heroines. Q: Why the change from more fantasy-based books like Study and Glass to the more sci-fi feel of Inside Out? A: I dreamt the story, characters and twists for INSIDE OUT. However, I always enjoyed reading science fiction and have written a number of short stories in that genre, so doing a novel length didn’t seem like a big change for me. Q: Can you tell us anything about Outside In? Is it the last of the series? A: OUTSIDE IN picks up about 12 weeks after the end of INSIDE OUT. The world of Inside has been turned…er…upside down ;> and there are many changes and problems involved with the aftermath. Trella feels she has done her part and can now relax and explore, but soon events drag her back into the thick of things. I don’t know if this book is the last or not. My publisher bought two books for this series, and hasn’t said anything about wanting a third book. Publishing is a business and if the Inside series doesn’t sell well, then they won’t publish anymore books in that series. Q: It seems like you are publishing a TON of books! How much/often do you write a day? A: I try to write about 5 hours a day or at least 1,000 words. I’m a slow writer compared to other authors. 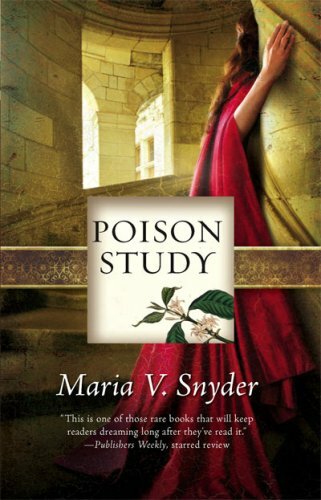 The reason my books have been coming out two a year, is I had a couple years before POISON STUDY came out to write, so I had a bit of a backlog of books. Not anymore! So my books will slow back down to one a year or one every nine months. Q: Typed or handwritten? Mac, or PC? A: Typed unless I’m stuck somewhere without my computer. And a PC. Finally, some fun from the random plot generator! Q: Your editor returns your manuscript and informs you that one of your characters in Inside Out needs to be a paranormal creature in disguise. Who do you choose, and what creature do they become? What can you win? Oodles of stuff! Maria has donated SIGNED Inside Out Bookmarks, Glass series bookmarks, and a SIGNED copy of SPY GLASS! Squee! Fill out the form to enter, open to US residents only! Okay, I feel a little guilty/greedy entering this one because I won a signed copy of Inside Out last month. It's the only book I've read yet by Maria Snyder, but I loved it. I enjoyed the interview immensely. Thanks for doing it! I LOVED all Maria's books! Count me in!